ClonaCell™-HY Medium D is a semi-solid methylcellulose-based medium containing serum and the selective agents hypoxanthine, aminopterin, and thymidine (HAT). 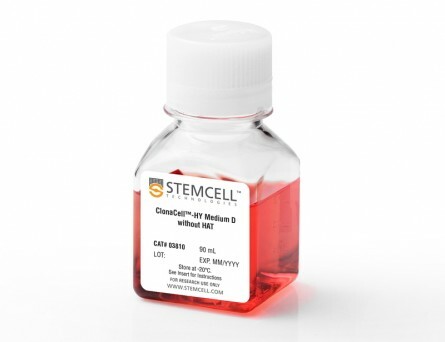 This medium is used after fusion of lymphocytes and myeloma cells to select and clone hybridomas in one step. Individual parental hybridoma clones and their progeny remain localized together in the semi-solid matrix as they grow to form distinct colonies. 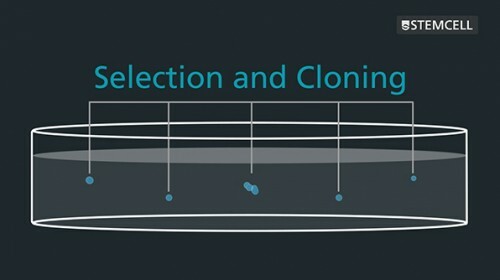 This prevents the loss of rare clones by overgrowth from faster-growing cells, as can occur during selection in a liquid medium, and facilitates the isolation of monoclonal colonies. The hybridoma colonies can be easily picked from the semi-solid medium by manual or robotic methods and dispersed into a liquid medium for screening and expansion. 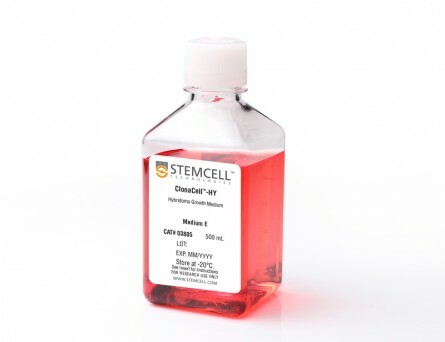 This medium has been verified for use in mouse and rat hybridoma development and reportedly is compatible for production and cloning of hybridomas using lymphocytes from a variety of host animals including human, mouse, rat, and hamster. • Individual cells are suspended in viscous medium and form physically separated, discrete colonies that are easily isolated. • Monoclonal cell lines are isolated in less time using fewer resources compared with selection and cloning by limiting dilution. • Diverse clones with a wide range of growth rates and productivities form discrete colonies in the viscous medium. 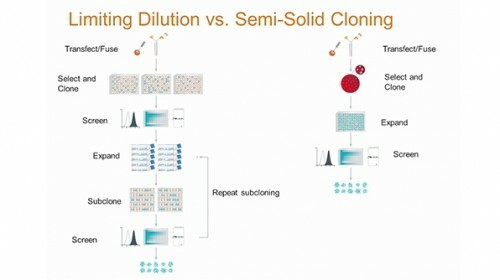 As a result, rare and high-producing clones can be individually isolated more easily using simultaneous selection and cloning in semi-solid medium compared with selection in bulk liquid cultures. Why do I get more cells when I select my fusion in liquid medium rather than in methylcellulose-based semi-solid medium? Cells grown in liquid medium may appear to grow more rapidly than in methylcellulose-based medium. This is often due to the presence of a few rapidly growing clones that multiply quickly and become abundant in liquid culture, overgrowing clones that grow more slowly. In methylcellulose cultures, the rapidly growing cells remain in close proximity to each other, resulting in large colonies, each derived from a single fusion or transfection product. The large clones don't overgrow smaller, slower growing colonies, which can be separately isolated. How do I thaw ClonaCell™ methylcellulose-based semi-solid medium? We recommend thawing the medium overnight in a refrigerator at 4°C and mixing well. How do I measure and dispense methylcellulose semi-solid medium? We recommend using a 12 mL syringe with a 16 gauge needle attached (blunt end needles are recommended for safety purposes). Do not dispense the semi-solid media/cell mixture using serological pipettes as the media will stick to the pipette walls, resulting in inaccurate dispensed volumes and loss of cells. My ClonaCell™ methylcellulose semi-solid medium appears runny. Why does this happen? "Runny" methylcellulose could be a result of improper handling. Diluting the methylcellulose with too much liquid medium, or insufficient mixing before use, will result in methylcellulose with altered viscosity. Excessive condensation on the inside of the cell culture dish lid can result in water dripping onto the cultures, lowering viscosity. Additionally, bumping, shaking or other sudden movement of the culture may also disrupt the colonies. Note: methylcellulose is less viscous at room temperature than at 37°C. What is the optimal number of colonies per plate? We recommend 50-150 colonies per plate. As it is difficult to anticipate the numbers of colonies after a fusion or transfection, we recommend plating at three different densities to increase the likelihood of achieving a plating density of approximately 100 colonies per plate. This density allows sufficient space between the colonies to allow for easy colony picking. There are still bubbles in the media after I plate my cells. Do I need to disrupt the bubbles? We recommend that you avoid creating large bubbles during plating, but there is no need to manually pop or disperse the small bubbles after plating. They will disperse over the incubation period of 10-14 days. Do I ever need to re-clone cultures grown with ClonaCell™ semi-solid medium? Re-cloning is a good practice to observe and is recommended if the number of colonies in the original dishes was very high. Once I pick the colonies and grow the cells in plates, will the residual methylcellulose interfere with characterization? For example, will I have problems doing an ELISA? There will likely be some residual methylcellulose contamination when colonies are picked and transferred to the 96-well plate with the liquid growth medium. 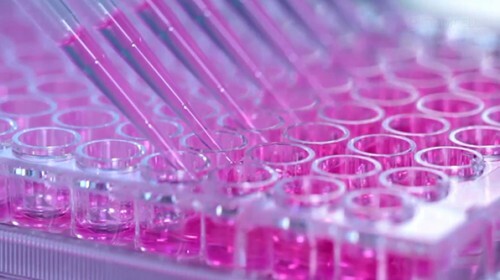 The concentration of methylcellulose, however, should be low enough that it should not interfere with most assays. How important is the incubator humidity when culturing in methylcellulose-based medium? Very important. In situations where the humidity is not high enough, we recommend that the 100 mm Petri dishes should be placed with an open dish containing sterile water inside a larger plastic container with a lid. Without very high humidity, the media will dry out over the culture period and this will impede the growth of the colonies. Do I have to use 100 mm petri dishes or can I use other cultureware? We recommend 100 mm Petri dishes as these have been used to develop and test ClonaCell™ semi-solid media. We have found that the surface area of these dishes allows for easy colony picking. Other sizes of dish (e.g. 6-well plates) can be used. It is important to use non-coated dishes to prevent cells from sticking to the bottom of the plate and obscuring the colonies. The volume of media plated should be adjusted to reflect the surface area of the dish being used. Why is there HT (hypoxanthine, thymidine) in Medium E? Hybridomas are selected using HAT (hypoxanthine, aminopterin, thymidine). Aminopterin blocks the de novo pathway for synthesizing nucleotide precursors for DNA synthesis. The inhibition of the de novo pathway can persist even after the cells are removed from selection. Hypoxanthine and thymidine (HT) provide the necessary nucleotide precursors for hybridoma cells to synthesize DNA using the salvage pathway. Once the cells are growing well in Medium E, they can be gradually switched to Medium A or another medium without HT. Is the serum in ClonaCell™-HY media heat inactivated? Yes, all serum used in ClonaCell™-HY media is heat inactivated. Is there any IgG in clonacell™-HY media? While we don't add IgG to the ClonaCell™-HY media, we do add serum, which contains an undefined amount of IgG. We selectively use serum lots with low IgG levels in the production of ClonaCell™-HY media, however, levels vary from lot to lot. IgG levels in a specific lot of ClonaCell™-HY medium are available in the lot-specific Certificate of Analysis. Are there antibiotics in ClonaCell™-HY media? These products contain gentamycin rather than penicillin/streptomycin/amphotericin B, because gentamycin is more stable and is a broad spectrum antibiotic that is non-toxic to most mammalian cells in culture. We recommend 50-150 colonies per plate. An average fusion will result in approximately 1000 colonies per fusion (approx. 100 colonies per plate). Even if the average number of colonies per plate approaches 300, there should still be enough separation between colonies to pick easily. Why do I have to put my fused cells into liquid medium overnight? Why can't I just plate directly into Medium D? We recommend waiting up to 24 hours so that all of the fused cells can go through one cell cycle. This will ensure they have a chance to express HPRT (hypoxanthine guanine phosphoribosyltransferase), the enzyme necessary to survive in the presence of aminopterin (present in Medium D). Additionally, fused cells are very fragile immediately after fusion. Waiting a day before mixing the cells with the methylcellulose will improve their survival. 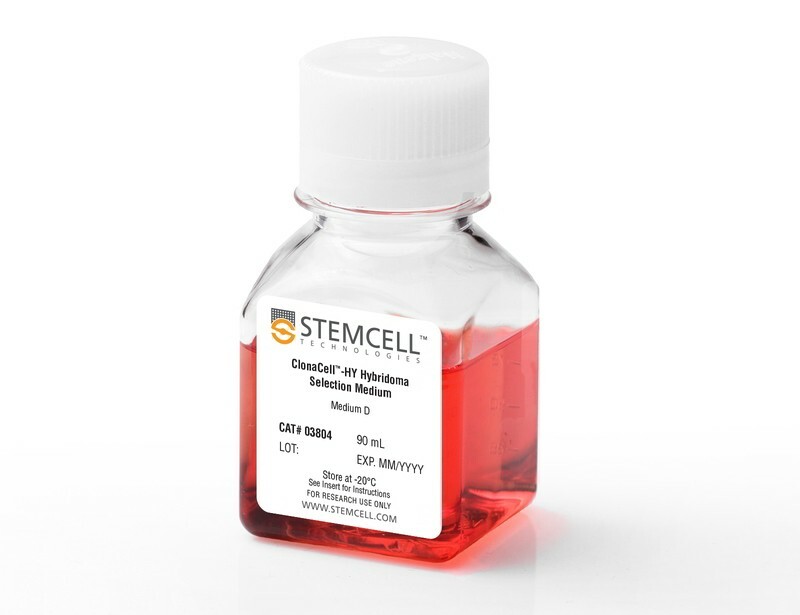 Although it is not recommended, fused cells may be plated on the same day as fusion, but the cells should be allowed to recover for several hours in ClonaCell™-HY Medium C prior to plating. What myeloma and mouse strains should I use? Myeloma: There are at least two common myeloma cell lines used to generate hybridomas - SP2/0 and P3X63Ag8.683. Both are available from ATCC. Researchers should ensure that the myeloma line is from a reliable source and is negative for mycoplasma. Mycoplasma contamination of the myeloma line can result in decreased efficiency of hybridoma formation. Mouse: We suggest using BALB/c splenocytes and parental myeloma cells of BALB/c for the following reasons: they are highly immune reactive, well characterized and myeloma cells are available from the same genetic strain. Other mouse strains, however, are also compatible with cloning in ClonaCell™-HY media. Can I grow human/rat/T cell hybridomas in ClonaCell™-HY? 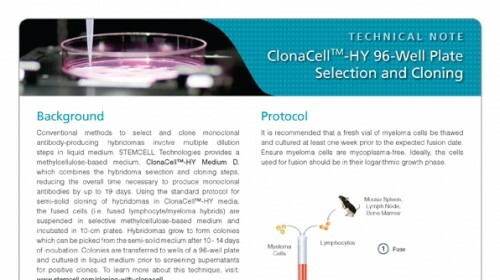 Although we have not tried to generate human, rat or T cell hybridomas during in-house testing, these experiments are expected to be successful using ClonaCell™-HY. The researcher would need to ensure that the cell lines used in the fusion are sensitive to HAT selection and grow well in methylcellulose-based medium. There are very few colonies growing in my Medium D. Why? Low numbers of colonies is generally a result of low fusion efficiency, which can have many causes. The fusion efficiency can be affected by the presence of serum during fusion, the presence of mycoplasma, low viability of cells, overexposure to polyethylene glycol or slow-growing myeloma cells prior to fusion. Why does the ClonaCell™-HY manual suggest two different methods for fusion (A or B)? Can one expect better results with one method over the other? Which method chosen is a personal preference and there should not be significant differences in efficiency. Method B is faster and has less steps, but Method B requires you to remove all the PEG before the cells are diluted, so you will risk aspirating cells if not very careful. With Method A, you dilute the PEG with Medium B, so you have less opportunity to lose cells. A: Which method chosen is a personal preference and there should not be significant differences in efficiency. Method B is faster and has less steps, but Method B requires you to remove all the PEG before the cells are diluted, so you will risk aspirating cells if not very careful. With Method A, you dilute the PEG with Medium B, so you have less opportunity to lose cells. Is the serum in ClonaCell™-TCS medium heat inactivated? Yes, all serum used in ClonaCell™ is heat inactivated. Is there any IgG in ClonaCell™ TCS? While we don't add IgG to the ClonaCell™ media, we do add serum, which contains an undefined amount of IgG. We selectively use serum lots with low IgG levels in the production of ClonaCell™ media, however, levels vary from lot to lot. IgG levels in a specific lot of ClonaCell™ TCS medium are available in the lot-specific Certificate of Analysis. 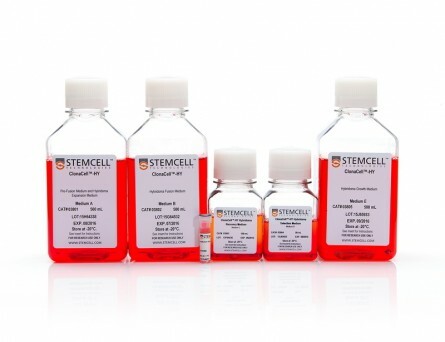 Can ClonaCell™-TCS be used with any cell line? 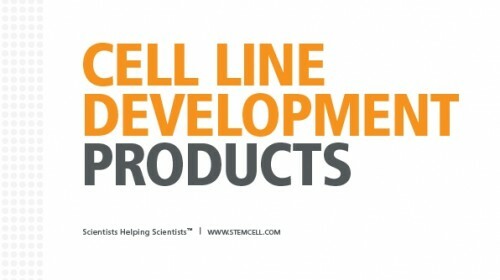 A list of recommended cell lines can be found in the manual. 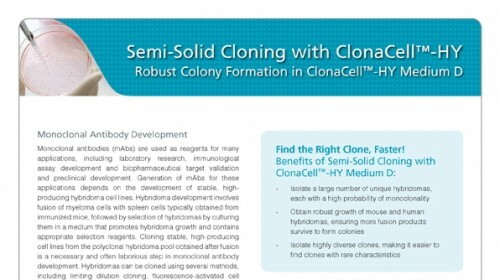 Other cell lines may be compatible with ClonaCell™-TCS. It will be necessary, however, to determine the plating cell density and growth efficiency of the desired cells in ClonaCell™-TCS.